Elwyn Davies joined the firm in 1982 . After 3 years gaining experience in agricultural valuations, farm agency and livestock marketing he became fully involved in the sales of live and deadstock. 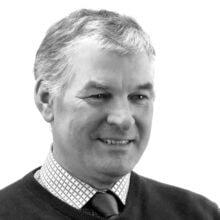 Elwyn is the Managing Director of Hobbs Parker Auctioneers LLP and has specific responsibility for Sheep within our Livestock Marketing Team as well as Farm Dispersal Sales. Elwyn read Land Management (Rural Studies Specialisation) at Reading University and left with an Honours Degree in 1982. He became a member of the Central Association of Agricultural Valuers in 1985 and a member of the Royal Institution of Chartered Surveyors in 1986. He is currently chairman of the South East Livestock Auctioneers Association and South Eastern Representative to the LAA Council.